Not to be confused with Electron beam computed tomography. During dental/orthodontic imaging, the CBCT scanner rotates around the patient's head, obtaining up to nearly 600 distinct images. For interventional radiology, the patient is positioned offset to the table so that the region of interest is centered in the field of view for the cone beam. A single 200 degree rotation over the region of interest acquires a volumetric data set. The scanning software collects the data and reconstructs it, producing what is termed a digital volume composed of three-dimensional voxels of anatomical data that can then be manipulated and visualized with specialized software. CBCT shares many similarities with traditional (fan beam) CT however there are important differences, particularly for reconstruction. CBCT has been described as the gold standard for imaging the oral and maxillofacial area. Cone beam technology was first introduced in the European market in 1996 by QR s.r.l. (NewTom 9000) and into the US market in 2001. In 2013, during the Festival della Scienza in Genova, Italy, the original members of the research group (Attilio Tacconi, Piero Mozzo, Daniele Godi and Giordano Ronca) received an award for the invention of cone-beam CT.
A dental cone beam scan offers useful information when it comes to the assessment and planning of surgical implants. The American Academy of Oral and Maxillofacial Radiology (AAOMR) suggests cone-beam CT as the preferred method for presurgical assessment of dental implant sites. As a 3D rendition, CBCT offers an undistorted view of the dentition that can be used to accurately visualize both erupted and non-erupted teeth, tooth root orientation and anomalous structures, that conventional 2D radiography cannot. The CBCT scanner offers undistorted views of the extremities. One advantage of orthopedic CBCT is the ability to take weight bearing images of the lower extremities. In the realm of the foot and ankle particularly, weight bearing CBCT (WBCBCT) is gaining momentum due to its ability to combine 3 dimensional and weight bearing information which are of the utmost importance in diagnosis and surgical planning. The CBCT scanner is mounted on a C-arm fluoroscopy unit in the interventional radiology (IR) suite, which offers real time imaging with a stationary patient. This eliminates the time needed to transfer a patient from the angiography suite to a conventional computed tomography scanner and facilitates a broad spectrum of applications of CBCT during IR procedures. The clinical applications of CBCT in IR include treatment planning, device or implant positioning and assessment, intra-procedural localization, and assessment of procedure endpoints. CBCT is useful as a primary and supplemental form of imaging. It is an excellent adjunct to DSA and fluoroscopy for soft tissue and vascular visibility during complex procedures. The use of CBCT before fluoroscopy potentially reduces patient radiation exposure. Chemoembolization for Hepatocellular Carcinoma: CBCT with contrast confirms that the proper artery is selected to deliver the therapy. The contrast enhances the parenchyma supplied by the selected artery and therefore reveals if the vasculature also supplies the tumor. Post treatment noncontrast CBCT confirms lipiodol staining of the tumor, which improves operator confidence of complete tumor coverage or further treatment. Prostatic artery embolization for benign prostatic hypertrophy: CBCT provides the soft tissue detail needed to visualize prostatic enhancement, identify duplicated prostatic arteries, and avoid nontarget embolization. CBCT is superior to DSA for this therapy since the enhancement patterns on DSA can be difficult to discern due to the overlapping pelvic structures and variable arterial anatomy. Abscess drainage: CBCT confirms needle tip location after placement under ultrasound and confirms drain placement by revealing contrast injection into the desired location. Adrenal Vein sampling for an adenoma: contrast enhanced CBCT shows perfusion of the adrenal gland to confirm catheter placement for obtaining a satisfactory sample. Stent placement: CBCT improves the visualization of intracranial and extracranial stents compared to conventional DSA and digital radiography by providing a better depiction of the relationship of the stents to nearby structures (i.e. vascular walls and aneurysm lumen). Lung nodule percutaneous transthoracic needle biopsy: CBCT guides needle placement and demonstrated a diagnostic accuracy, sensitivity, and specificity of 98.2%, 96.8%, and 100%, respectively. Diagnostic accuracy was unaffected by technically challenging conditions. Vascular Anomalies: After correction of arteriovenous malformations with coiling, CBCT sensitively detects small infarcts in tissue that has been "sacrificed" during the procedure to prevent further shunting. The infarcted tissue appears as a small area of contrast retention. While the practicality of CBCT fosters its increasing application in IR, technical limitations hinder its integration into the field. The two most significant factors that affect successful integration are image quality and time (for set up, image acquisition, and image reconstruction). Compared to multidetector computed tomography (MDCT), the wider collimation in CBCT leads to increased scatter radiation and degradation of image quality as demonstrated by artifacts and decreased contrast-to-noise ratio. The temporal resolution of cesium iodide detectors in CBCT slows data acquisition time to approximately 5 to 20 seconds, which increases motion artifacts. The time required for image reconstruction takes longer for CBCT (1 minute) compared to MDCT (real time) due to the computationally demanding cone beam reconstruction algorithms. Cone beam reconstruction algorithms are similar to typical tomographic reconstruction algorithms, and methods such as filtered backprojection or iterative reconstruction may be used. However, since the reconstruction is three-dimensional, modifications such as the FDK algorithm may be needed. CBCT use is only lightly regulated in the US. The recommended standard of care is to use the smallest possible field of view (FOV), the smallest voxel size, the lowest mA setting and the shortest exposure time in conjunction with a pulsed exposure mode of acquisition. International organisations such as the World Health Organization and ICRP, as well as many local bodies and legislation, encourage the idea of justification for all medical exposures, where risks and benefits must be weighed up before a procedure goes ahead. There are a number of drawbacks of CBCT technology over that of medical-grade CT scans, such as increased susceptibility to movement artifacts (in first generation machines) and to the lack of appropriate bone density determination. The Hounsfield scale is used to measure radiodensity and, in reference to medical-grade CT scans, can provide an accurate absolute density for the type of tissue depicted. The radiodensity, measured in Hounsfield Units (HU, also known as CT number) is inaccurate in CBCT scans because different areas in the scan appear with different greyscale values depending on their relative positions in the organ being scanned, despite possessing identical densities, because the image value of a voxel of an organ depends on the position[clarification needed] in the image volume. HU measured from the same anatomical area with both CBCT and medical-grade CT scanners are not identical and are thus unreliable for determination of site-specific, radiographically-identified bone density for purposes such as the placement of dental implants, as there is "no good data to relate the CBCT HU values to bone quality." Although some authors have supported the use of CBCT technology to evaluate bone density by measuring HU, such support is provided erroneously because scanned regions of the same density in the skull can have a different grayscale value in the reconstructed CBCT dataset. X-ray attenuation of CBCT acquisition systems currently produces different HU values for similar bony and soft tissue structures in different areas of the scanned volume (e.g. dense bone has a specific image value at the level of the menton, but the same bone has a significantly different image value at the level of the cranial base). Dental CBCT systems do not employ a standardized system for scaling the grey levels that represent the reconstructed density values and, as such, they are arbitrary and do not allow for assessment of bone quality. In the absence of such a standardization, it is difficult to interpret the grey levels or impossible to compare the values resulting from different machines. While there is a general acknowledgment that this deficiency exists with CBCT systems (in that they do not correctly display HU), there has been little research conducted to attempt to correct this deficiency. With time, further advancements in CBCT reconstruction algorithms will allow for improved area detectors, and this, together with enhanced postprocessing, will likely solve or reduce this problem. A method for establishing attenuation coefficients with which actual HU values can be derived from CBCT HU values was published in 2010 and further research is currently under way to perfect this method in vivo. ^ Technical Description of CBCT from University of Manchester. Citing: Scarfe WC, Farman AG, Sukovic P (February 2006). "Clinical applications of cone-beam computed tomography in dental practice". Journal of the Canadian Dental Association. 72 (1): 75–80. PMID 16480609. ^ a b Hatcher DC (October 2010). "Operational principles for cone-beam computed tomography". Journal of the American Dental Association. 141 (Suppl 3): 3S–6S. doi:10.14219/jada.archive.2010.0359. PMID 20884933. ^ a b c Orth RC, Wallace MJ, Kuo MD (June 2008). "C-arm cone-beam CT: general principles and technical considerations for use in interventional radiology". Journal of Vascular and Interventional Radiology. 19 (6): 814–20. doi:10.1016/j.jvir.2008.02.002. PMID 18503894. ^ "Dalla scienza alla bellezza, dalla radiologia all'arte - Festival della Scienza 2013". festival2013.festivalscienza.it. ^ Rizzato, Stefano (25 October 2013). "Il lato artistico dei raggi X". La Stampa (in Italian). ^ "20st Anniversary of the 1st dental CBCT complete scan — NewTom". www.newtom.it. ^ Mah JK, Huang JC, Choo H (October 2010). "Practical applications of cone-beam computed tomography in orthodontics". Journal of the American Dental Association. 141 (Suppl 3): 7S–13S. doi:10.14219/jada.archive.2010.0361. PMID 20884934. Archived from the original on 2014-07-18. ^ Barg, Alexej; Bailey, Travis; Richter, Martinus; Netto, Cesar; Lintz, François; Burssens, Arne; Phisitkul, Phinit; Hanrahan, Christopher J.; Saltzman, Charles L. (24 November 2017). "Weightbearing Computed Tomography of the Foot and Ankle: Emerging Technology Topical Review". Foot & Ankle International. 39 (3): 376–386. doi:10.1177/1071100717740330. PMID 29171283. ^ a b Wallace MJ, Kuo MD, Glaiberman C, Binkert CA, Orth RC, Soulez G (June 2008). "Three-dimensional C-arm cone-beam CT: applications in the interventional suite". Journal of Vascular and Interventional Radiology. 19 (6): 799–813. doi:10.1016/j.jvir.2008.02.018. PMID 18503893. ^ Bagla S, Rholl KS, Sterling KM, et al. (November 2013). "Utility of cone-beam CT imaging in prostatic artery embolization". Journal of Vascular and Interventional Radiology. 24 (11): 1603–7. doi:10.1016/j.jvir.2013.06.024. PMID 23978461. ^ Georgiades CS, Hong K, Geschwind JF, et al. (September 2007). "Adjunctive use of C-arm CT may eliminate technical failure in adrenal vein sampling". Journal of Vascular and Interventional Radiology. 18 (9): 1102–5. doi:10.1016/j.jvir.2007.06.018. PMID 17804771. ^ Benndorf G, Claus B, Strother CM, Chang L, Klucznik RP (April 2006). "Increased cell opening and prolapse of struts of a neuroform stent in curved vasculature: value of angiographic computed tomography: technical case report". Neurosurgery. 58 (4 Suppl 2): ONS–E380, discussion ONS–E380. doi:10.1227/01.NEU.0000205287.06739.E1. PMID 16575290. ^ Choi JW, Park CM, Goo JM, et al. (September 2012). "C-arm cone-beam CT-guided percutaneous transthoracic needle biopsy of small (≤ 20 mm) lung nodules: diagnostic accuracy and complications in 161 patients". American Journal of Roentgenology. 199 (3): W322–30. doi:10.2214/AJR.11.7576. PMID 22915422. ^ Feldkamp, L. A.; Davis, L. C.; Kress, J. W. (1984-06-01). "Practical cone-beam algorithm". JOSA A. 1 (6): 612–619. Bibcode:1984JOSAA...1..612F. CiteSeerX 10.1.1.331.8312. doi:10.1364/JOSAA.1.000612. ISSN 1520-8532. ^ Health, Center for Devices and Radiological. "Medical X-ray Imaging - Dental Cone-beam Computed Tomography". www.fda.gov. ^ "Radiation doses and risks of CBCT - SEDENTEXCT". www.sedentexct.eu. ^ Signorelli L, Patcas R, Peltomäki T, Schätzle M (January 2016). "Radiation dose of cone-beam computed tomography compared to conventional radiographs in orthodontics". Journal of Orofacial Orthopedics. 77 (1): 9–15. doi:10.1007/s00056-015-0002-4. PMID 26747662. ^ Grünheid T, Kolbeck Schieck JR, Pliska BT, Ahmad M, Larson BE (April 2012). "Dosimetry of a cone-beam computed tomography machine compared with a digital x-ray machine in orthodontic imaging". American Journal of Orthodontics and Dentofacial Orthopedics. 141 (4): 436–43. doi:10.1016/j.ajodo.2011.10.024. PMID 22464525. ^ "Justification of medical exposures". World Health Organization. Retrieved 31 January 2018. ^ a b De Vos W, Casselman J, Swennen GR (June 2009). "Cone-beam computerized tomography (CBCT) imaging of the oral and maxillofacial region: a systematic review of the literature". International Journal of Oral and Maxillofacial Surgery. 38 (6): 609–25. doi:10.1016/j.ijom.2009.02.028. PMID 19464146. ^ a b Swennen GR, Schutyser F (September 2006). "Three-dimensional cephalometry: spiral multi-slice vs cone-beam computed tomography". American Journal of Orthodontics and Dentofacial Orthopedics. 130 (3): 410–6. doi:10.1016/j.ajodo.2005.11.035. PMID 16979502. ^ Armstrong RT (2006). "Acceptability of cone beam ct vs. multi-detector CT for 3D Anatomic model construction". Journal of Oral and Maxillofacial Surgery. 64 (9): 37. doi:10.1016/j.joms.2006.06.086. ^ Miles DA, Danforth RA (2007). 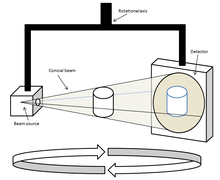 "A clinician's guide to understanding cone beam volumetric imaging (CBVI)" (PDF). INeedCE. ^ Ganz SD (December 2005). "Conventional CT and cone beam CT for improved dental diagnostics and implant planning". Dental Implantology Update. 16 (12): 89–95. PMID 16422471. ^ Lee S, Gantes B, Riggs M, Crigger M (2007). "Bone density assessments of dental implant sites: 3. Bone quality evaluation during osteotomy and implant placement". The International Journal of Oral & Maxillofacial Implants. 22 (2): 208–12. PMID 17465345. ^ Katsumata A, Hirukawa A, Noujeim M, et al. (May 2006). "Image artifact in dental cone-beam CT". Oral Surgery, Oral Medicine, Oral Pathology, Oral Radiology, and Endodontics. 101 (5): 652–7. doi:10.1016/j.tripleo.2005.07.027. PMID 16632279. ^ Norton MR, Gamble C (February 2001). "Bone classification: an objective scale of bone density using the computerized tomography scan". Clinical Oral Implants Research. 12 (1): 79–84. doi:10.1034/j.1600-0501.2001.012001079.x. PMID 11168274. ^ a b Mah P, Reeves TE, McDavid WD (September 2010). "Deriving Hounsfield units using grey levels in cone beam computed tomography". Dentomaxillofacial Radiology. 39 (6): 323–35. doi:10.1259/dmfr/19603304. PMC 3520236. PMID 20729181. ^ Vannier MW (2003). "Craniofacial computed tomography scanning: technology, applications and future trends". Orthodontics & Craniofacial Research. 6 Suppl 1: 23–30, discussion 179–82. doi:10.1034/j.1600-0544.2003.232.x. PMID 14606531. Jonathan Fleiner, Nils Weyer, Andres Stricker: CBCT-Diagnostics, Cone Beam Computed Tomography, The most important cases in clinical daily routine, Systematic Radiographic Investigation, Diagnostics, Treatment Approach Verlag 2einhalb, ISBN 978-3-9815787-0-6. www.cbct-3d.com. This page was last edited on 28 February 2019, at 09:21 (UTC).